ITN has been named as Google's partner for its 'Gears Geolocation API' – allowing you to find local news stories based on your current location. Independent Television News has been at the forefront of Britain's news for years, and a partnership with search giants Google should bring its content to a whole new generation. 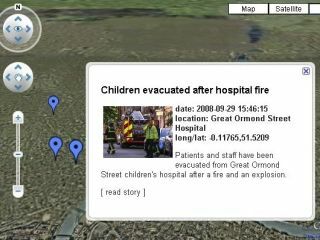 The application 'pinpoints the location of the mobile cell or Wi-Fi access point and highlights ITN news stories near that location on Google Maps or Google Earth'. "From the location interface, it's easy to visit the ITN website to read a story or play an associated video," adds the press release. "ITN really is at the cutting edge of technology, delivering innovative news features on both mobile and desktop," said Google product manager Charles Wiles. "The ability to see Google Earth in the browser - automatically centred on your current location and with stories relevant to your current location layered on top - is incredibly useful." ITN are showcasing the service at www.itn.co.uk/news/earth.html and the company's head of new media, Ave Wrigley, believes that the service will quickly become popular. "The Geolocation API is a real breakthrough, allowing content providers like ITN for the first time to easily develop location aware services without complex and potentially costly arrangements with third-party service providers or mobile operators. "We have done a lot of work in geotagging our news stories in the last year or so, and this technology allows us to really bring this to life."